Play your favorite games with the ASUS 15.6" Republic of Gamers Strix GL503VD Gaming Laptop. The GL503VD features a 15.6" display with a Full HD 1920 x 1080 screen resolution and a 16:9 aspect ratio, powered by an NVIDIA GeForce GTX 1050 graphics card with 4GB of GDDR5 VRAM. The display also has a matte finish to help reduce screen glare. It also features an Aura keyboard with customizable RGB lighting. The system is powered by a 7th Gen Kaby Lake 2.8 GHz Intel Core i7-7700HQ quad-core processor. It also has 16GB of 2400 MHz DDR4 RAM, a 1TB 7200 rpm HDD, a 256GB SSD, a SD/MMC card slot, 10/100/1000 Mbps Gigabit Ethernet, 802.11ac Wi-Fi, Bluetooth 4.1, USB 3.0 Type-C, HDMI, and Mini DisplayPort. Windows 10 Home (64-bit) is the installed operating system. The Strix GL503VD is equipped with customizable RGB lighting so you can adjust it as you see fit. ROG Gaming Center gives you access to multiple features such as system information, macros, audio settings, and more. Box Dimensions (LxWxH) 16.772 x 12.756 x 3.386"
15.6" Republic of Gamers Strix GL503VD Gaming Laptop is rated 4.2 out of 5 by 5. Rated 5 out of 5 by John from Great Gaming Laptop I own this laptop and got it earlier this year to run all my games. I compared it with my other laptop which has Intel Graphics and a I5 processor and my games on ultra with the Nvidia GTX 1050 Graphics the games are stunning. I can see things I did not before. 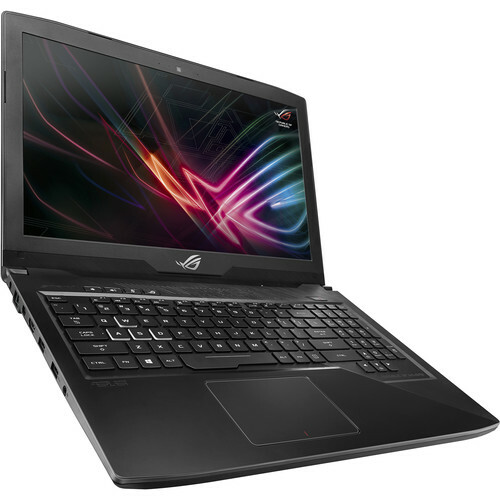 It is heavy and has a relatively short battery life running on the GTX graphics but these gaming laptops are made to be plugged in. It has a very nice back-lit keyboard that you can customize with colors and brightness, a user controlled fan to keep things cool, Windows 10 which is nice now. You can select user intensive programs to run on the graphics card such as converting video or ripping DVD's and that's a nice touch. The screen is quite pleasant to look at running your games on ultra and they run smooth in 60FPS or more per second. My YouTube gaming videos can out perfect. This gaming laptop comes highly recommended for the money. Rated 5 out of 5 by randall from 5 stars when i knew i was going to buy a laptop i researched thoroughly and with my main purpose being audio and video creation of dvds. time and again i read where a gaming laptop was what i needed. the laptop works very well. Rated 1 out of 5 by NELSON from worst ?laptop ever I bought this laptop for my son last August, 2017. Everything worked well until November. We sent the laptop for repair as it was still under warranty. It is now FEBRUARY 2018 . Customer service said it was under repair. They said parts were ordered for the laptop but failed during testing. Same excuse every time I called them. Please do not but ASUS laptops. Repairs take forever. I am lucky if they fix it this year. Worst decision ever made! Rated 5 out of 5 by Bkilze from Good product It has a quick start up. It was simple to set up. Has a Game Center button for easy control of game settings. Keyboard backlites are configurable to your desired colors in 3 zones. I have played some games and had no problems with overheating. Happy so far.